Every second Saturday of each month in 2018, Save the Redwoods League and California State Parks will be hosting a Free Redwoods Day. Parking passes are available on a first come, first served basis each month, ahead of the next event. Be sure to reserve yours on FreeRedwoodsDays.org or sign up for our mailing list to receive an email notification when the passes for the next event are available for download. I joined the League more than 10 years ago, and it amazes me to think of all the milestones we’ve reached in the last decade, let alone the last 100 years. And I think we should all take pride in the redwood forests that are still standing today because people cared to save them. With the support of thousands of individuals like you, many of these forests are protected forever in some of the most beautiful parks in the world! Our state, as we know it, began in the wake of the 1849 Gold Rush. Between that year and 1856, about 300,000 people traveled over land and by sea to chase after the California Dream—a promise of sunshine, optimism and getting rich quick. Needless to say, industry boomed, and to meet the rising demand of development, our redwood forests that had thrived for over 20 million years faced unbelievable losses. 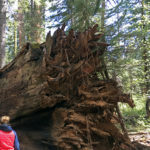 Fortunately, the League and other lovers of the redwood forests had the determination and foresight to organize on behalf of California’s remaining redwoods. Since 1918, the League has helped establish 66 redwoods parks and preserves in the state, and in total, we have protected more than 200,000 acres of redwood forests. This year marks our Centennial, and it’s our opportunity to fall in love with them all over again by celebrating in the parks and taking a stand for their future. As part of our Centennial celebration, I think everyone should experience, firsthand, the grandeur of the giant sequoia and coast redwood trees. Words and photographs just don’t do these forests justice; you must witness one in person to truly appreciate them. On our first Free Redwoods Day in January, Paul Ringgold, our Chief Program Officer, led a small group of hikers through Butano State Park. It was a sunny day, and several rough-skinned newts were out in the open, traversing the trail en route to Little Butano Creek. The group often paused to admire mushrooms and banana slugs along the trail. And Paul, who is an expert on coast redwood forest ecology, shared many interesting facts about the area’s natural history. By all accounts, it was tons of fun! The League and our park partners will be planning guided hikes and other interpretive programs for each of the free days. Visit our Free Redwoods Days webpages for more information and to get your parking pass. Also, be sure to sign up for our mailing list to receive notifications when the passes to the next free second Saturday are available for download. Did you know that Save the Redwoods League helped unite and form the California’s state park system in 1927? In addition to the Free Redwoods Days, we’re also celebrating our long-time partnership by offering Centennial Redwood Celebration Golden Poppy Annual Pass for purchase. For $125, the pass provides vehicle day-use admission to more than 100 parks statewide for a whole year. All proceeds from this pass will protect and steward redwood forests and other state parks throughout California. Learn more about the poppy pass and how you can get one. Join us for Tea with a Tree at Tu B’Shevat in the Park! Tu B’Shevat is a day to celebrate the trees and the work we all must do to keep our planet green and healthy for generations. Come celebrate Tu B’Shevat in San Francisco’s Golden Gate Park this Sunday, January 28, 2018.